Readers I am sharing you one of the important topic for both IBPS PO/CLERK interview January/ February 2015 that is Monetary Policy in India. 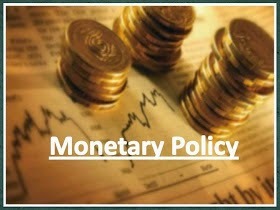 Monetary policy is the process by which monetary authority of a country i.e. RBI controls the supply of money in the economy by its control over interest rates in order to maintain price stability and achieve high economic growth. In India, the central monetary authority is the Reserve Bank of India (RBI) is so designed as to maintain the price stability in the economy. Quantitative measures to control amount of credit. Qualitative measures to control the allocation to different sections of economy. BANK RATE: The bank rate also known as the discount rate, is the rate of interest charged by the RBI for providing funds or loans to the Banking system in india. It also signals the medium-term stance of monetary policy. OPEN MARKET OPERTIONS(OMO): The buying and selling of government securities in the open market in order to expand or contract the amount of money in the banking system. Purchases inject money into the banking system and stimulate growth while sales of securities do the opposite. LIQUIDITY ADJUCTMENT FACILITY(LAF): Liquidity Adjustment Facility is the primary instrument of Reserve Bank of India for modulating liquidity and transmitting interest rate signals to the market. Under the scheme, repo auctions (for absorption of liquidity) and reverse repo auctions (for injection of liquidity) are conducted on a daily basis (except Saturdays). It is same-day transactions, with interest rates decided on a cut-off basis and derived from auctions on uniform price basis. REPO/REVERSE REPO RATE: These rates under the Liquidity Adjustment Facility (LAF) determine the corridor for short-term money market interest rates. In turn, this is expected to trigger movement in other segments of the financial market and the real economy. MARKET STABLISATION SCHEME (MSS): This instrument for monetary management was introduced in 2004. Liquidity of a more enduring nature arising from large capital flows is absorbed through sale of short-dated government securities and treasury bills. The mobilised cash is held in a separate government account with the Reserve Bank. CREDIT CEILING: In this operation RBI issues prior information or direction that loans to the commercial banks will be given up to a certain limit. In this case commercial bank will be tight in advancing loans to the public. They will allocate loans to limited sectors. Few example of ceiling are agriculture sector advances, priority sector lending. MORAL SUASION: Moral Suasions are suggestion and guidelines by the RBI to the commercial banks to take so and so action and measures in so and so trend of the economy. RBI may request commercial banks not to give loans for unproductive purpose which does not add to economic growth but increases inflation in the economy.